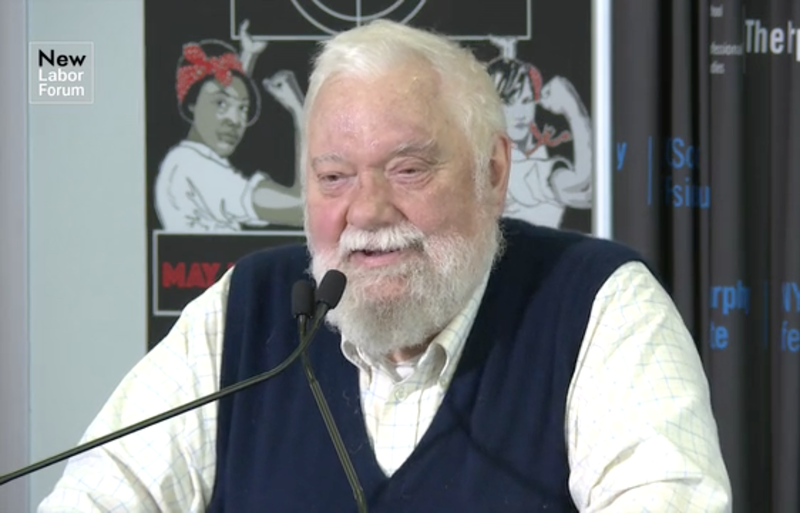 Yesterday, the terribly sad news reached Film Studies For Free that radical film and media scholar Chuck Kleinhans had died. Along with his wonderful partner in life and work Julia Lesage, Chuck has been a monumentally good friend to this blog over the years, mostly in his capacity as co-founding co-editor of the brilliant journal JUMP CUT, and as a phenomenal advocate for open access and "small gauge" scholarly and activist publishing. Alongside his own foundational work in cinema and media scholarship, Chuck was a remarkable and hugely influential mentor to many very important scholars in our field. If you should need a sense of what he gave us, please just watch the opening five minutes of the first video embedded below in which his friend (and fellow inspiring scholar and activist) Alexandra Juhasz does a great job of conveying his wonderful contributions. In this blog's humble view, we are losing Chuck just at the very moment when we need great champions of and participants in radical action like him the most. Let us continue his work as best we can, inspired by all that he did, to keep his memory much alive. 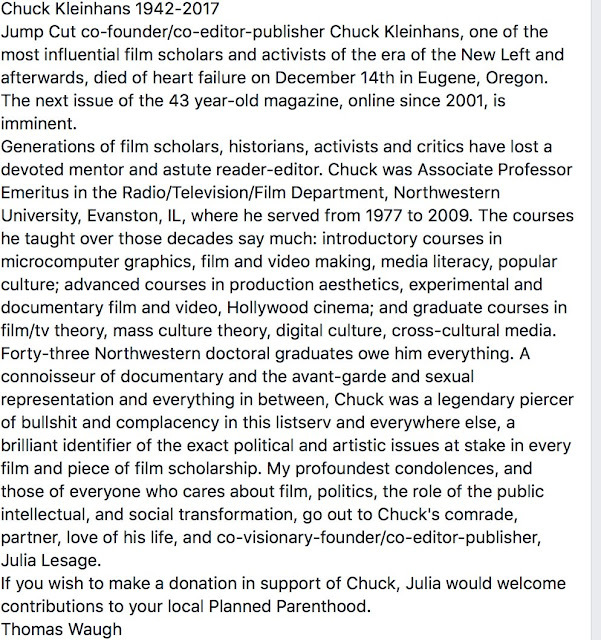 FSFF wishes to mark Chuck's passing in its customary way by this entry of links to his work (already amply available online), including to some as yet relatively uncirculated videos of two of his lectures (below) and eventually to online tributes as these appear. Please feel encouraged to leave your own tributes to him (or links to these) via the comments' thread below. FSFF sends its condolences and warmest wishes to Julia, and Chuck's family and friends. Chuck Kleinhans (Co-editor, JUMP CUT: A review of contemporary media). LINKED TO CHUCK'S Academia.edu page (more than 40 publicly available pieces by him, including many difficult to locate pieces). I have only just learned of Chuck's death. He was one of most enabling people I ever encountered in the world of film studies, open, warm, engaged and engaging. When I sent a piece on gays and film to Jump Cut in the late seventies, I did so because I felt so at home with its whole left approach to cinema, but I did not really expect quite the generosity and welcome that came from Chuck and the team. It was one of those moments that gives you the fillip to keep going along the same track. I only occasionally met him, in the UK and USA. One time in Chicago he picked me up and showed me some of the ethnically diverse neighbourhoods, winding up in a magnificent Polish deli for lunch, a cherished memory. Thank you, Chuck. Richard.